PARIS, 8 October (VCHR – IBIB) – The International Buddhist Information Bureau informs the international community with deep concern that Buddhist dissident and Supreme Patriarch of the Unified Buddhist Church of Vietnam (UBCV) Thích Quảng Độ boarded a train for the northen province of Thái Bình at 9:00am on Friday 5th October 2018 after being expelled from the Thanh Minh Zen Monastery in Saigon. According to IBIB’s information, Thích Quảng Độ was forced to leave the monastery on 90 Trần Huy Liệu Street, Phú Nhuận Ward, Saigon, following pressure from the monastery’s Superior monk Thích Thanh Minh. On 15th September 2018, Thích Thanh Minh “invited” Thích Quảng Độ to leave on the grounds that his presence caused political and economic problems to the monastery. Thích Quảng Độ left immediately, taking with him only a small suit-case with three monk’s robes. 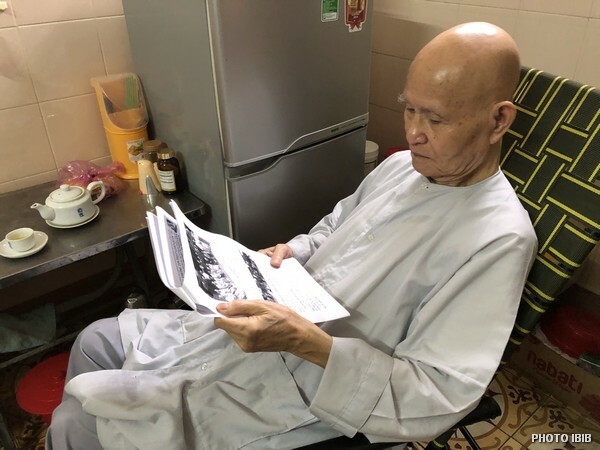 When his assistant came back later in the day to collect his sutras, books and belongings, Thích Thanh Minh had locked the staircase leading to his room and prevented the young monk from taking anything. Since then, Thích Quảng Độ, 91, moved from one pagoda to another in Saigon with no permanent place to stay. 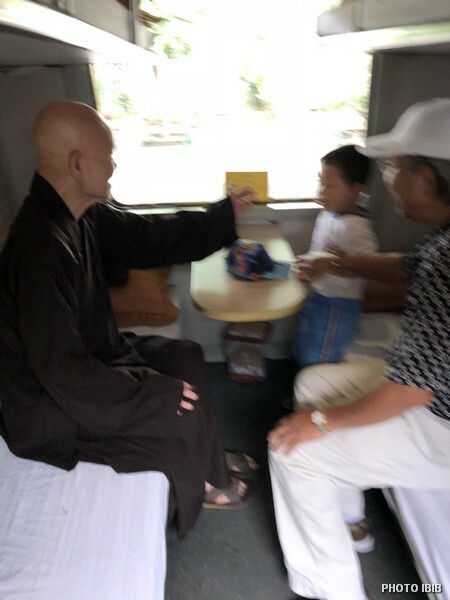 In fact, Thanh Minh Zen Monastery, where the UBCV Patriarch has been under house arrest without charge since 2003, does not belong to the UBCV but to the State-sponsored Vietnam Buddhist Sangha (VBS). Because Thích Thanh Minh was an old friend, Thích Quảng Độ went to live there after 1975 when his own pagoda was confiscated by the State. Despite house arrest, Thích Quảng Độ continued to speak out for religious freedom and human rights. 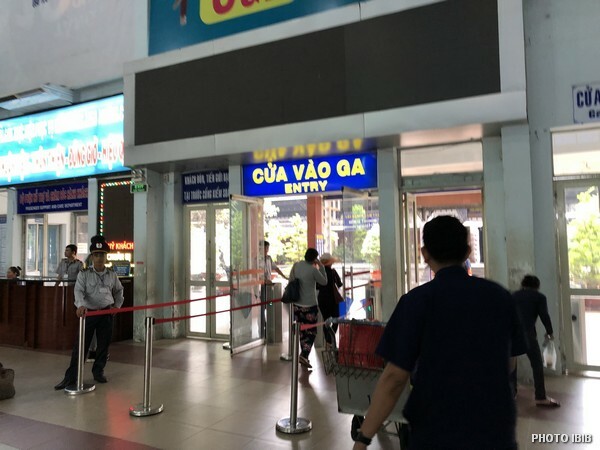 Over the past two years, the authorities have stepped up pressure to move Thích Quảng Độ away from the monastery to the State-sponsored Vĩnh Nghiêm Pagoda in Saigon, or to a pagoda in northern Vietnam. The UBCV Patriarch said he refused to move out unless Thích Thanh Minh asked him himself – which finally happened on 15.9.2018. 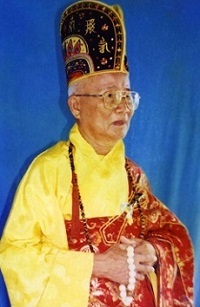 IBIB is nevertheless concerned for the situation of this eminent Buddist leader who has paid such a high price for his nonviolent advocacy of religious freedom, human rights and democracy, and whose his access to communications, health care and visits from UBCV followers will undoubtedly be limited in this remote northern province. 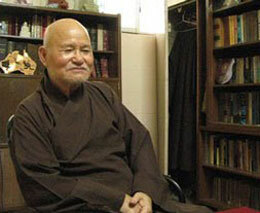 Biography: Most Venerable Thích Quảng Độ was born on November 27, 1928 in Thai Binh Province. Patriarch of the non-recognised Unified Buddhist Church of Vietnam (UBCV) since 2008, Thích Quảng Độ has been a lifelong advocate for democracy, religious freedom, and human rights. A monk since the age of 14, Thích Quảng Độ witnessed the summary execution of his religious master by a revolutionary People’s Tribunal in 1945. Profoundly disturbed by this image, he resolved to devote his life to the pursuit of justice through the Buddhist teachings of non-violence, tolerance and compassion. The Vietnamese authorities have repeatedly targeted, harassed, and detained Thích Quảng Độ both for practicing his faith and for his tireless advocacy for religious freedom and human rights: 1977-78: 20-months in solitary confinement in Phan Đang Lưu Prison, Saigon, for denouncing human rights abuses; 1982-1992: 10 years internal exile for protesting the creation of a State-sponsored Buddhist church and the banning of the UBCV; 1995-8: 5 years in prison in Ba Sao and Thanh Liệt prisons near Hanoi charged with “abusing democratic freedoms to harm the interests of the State” for leading a humanitarian relief mission for flood victims. Released in 1998 thanks to an intervention by then US Secretary of State Madeleine Albright, Vietnam pressured him to emigrate to the US, but Thích Quảng Độ refused. In 2001, he launched an “Appeal for Democracy in Vietnam”, a democratic transition plan which received overwhelming support from over 300,000 Vietnamese and hundreds of international personalities. For this, he was detained incommunicado at the Thanh Minh Zen Monastery for 2 years, deprived even of medical treatment. During a brief reprieve beginning in June 2003, Thích Quảng Độ attempted to participate in a UBCV Assembly called by then Patriarch Thích Huyền Quang. But in October 2003, authorities accused him of “possessing state secrets” and again confined him to Thanh Minh Zen Monastery where he has been under constant surveillance and effective house arrest ever since. Despite house arrest, he continued his action and appeals, assisting the movement of farmers (Dân Oan) protesting State confiscation of lands (2007); expressing solidarity with democraticy movements in Burma and Tibet (2008); launching a campaign of Civil Disobedience to stop environmentally-damaging Bauxite mining in the Central Highlands (2010); supporting thousands of young people in Hanoi and Saigon demonstrating against Chinese encroachment on Vietnamese lands (2011); calling for multi-party democracy and the abrogation of Article 4 of the Constitution on the political monopoly of the Communist Party during a government consultation on constitutional reform (2013); launching an appeal for a “broad-based movement for the democratization of Vietnam” as the sole way to protect Vietnamese sovereignty (2014). These efforts brought him renewed interrogations, harassment and accusations of “violating national security”. Thích Quảng Độ has been nominated 16 times for the Nobel Peace Prize. In November 2015, 91 international personalities, including four Nobel Peace Prize laureates, signed a letter to US President Obama calling for his release. Thích Quảng Độ was awarded the Rafto Memorial Prize by the Norwegian Rafto Foundation in 2006 for his role as a “unifying force” and a “symbol of the growing democracy movement in Vietnam”, the “Democracy Courage Tribute” by the World Movement for Democracy in 2006, and the “Homo Homini” Prize by the Czech Foundation People in Need 2003, under the auspices of the late President Vaclav Havel. He is an honorary member of PEN International, and is adopted as a prisoner of conscience by Amnesty International. The UN Working Group on Arbitrary Detention has pronounced Thích Quảng Độ’s detention to be a violation of international law (Opinion 18/2005). In April 2018, US Congressman Alan Lowenthal and Kristina Arriaga, Vice-President of the US Commission for International Religious Freedom (USCIRF) adopted Thích Quảng Độ as a prisoner of conscience through the “Defending Freedoms Project” of the US Congress’ Tom Lantos Human Rights Commission.